We created this winning Kaleidoscope Solitaire ring for the AGTA 2018 Spectrum Awards, our first ever entry into the AGTA national design contest. We are beyond thrilled to announce our win in the Business and Day Wear Division for Manufacturing Honors. The Spectrum Awards brings the fiercest of competition from the best and brightest designers in the industry. This Award is a momentous stepping stone for us and we are so grateful and excited to be counted among the top jewelry designers of 2018. Our Kaleidoscope design begins with an extraordinary old European cut 3.74 carat Malawi Aquamarine, set to perfection in our handmade 18k rose gold disc bezel and suspended on our hand carved platinum band. The finishing touch of a .241 carat vibrant red ruby, precision set just below the culet, creates a stunning kaleidoscope tapestry from above. 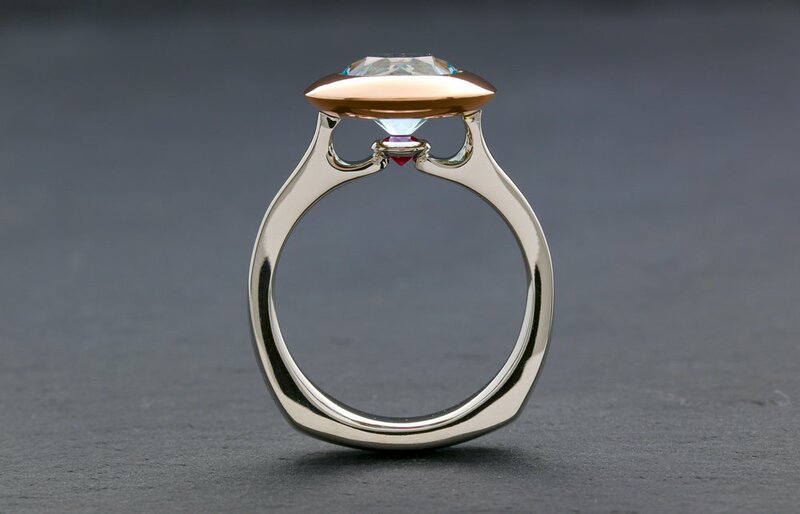 The Kaleidoscope Solitaire is a beautiful mashup of old world design and modern minimalist architecture. We are so thankful and honored to have this recognition for our work. We began this journey designing together over seven years ago. We have always been aligned with our vision and it is amazing to look back and see how far we have come. We greatly appreciate all of our clients, colleagues, friends and family who have been with us on this journey and we look forward to a wonderful and bright future.